In this FM8 tutorial we will be looking at how to use the Morph Matrix to create new sounds out of pre-existing patches, for more interesting instruments. To keep things simple I will be using factory patches, rather than designing new ones. This should make it easy for everyone to follow along with and gain a better understanding of how the Morph tool works and how to take advantage of some of the unique features it offers FM8 users. Although the end goal of this lesson is to make a nice blend of pads, you can use this same approach with just about any kind of sound(s) you can think of. So I highly encourage you all to experiment, and then experiment some more! We begin by selecting our four main sounds. You can use less, but this tutorial will show you how to use all four quadrants of the Morph Matrix to make out new pad. 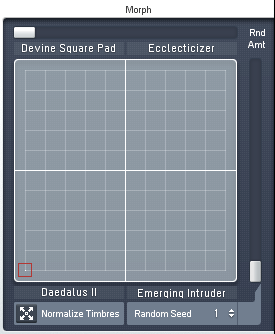 I started with a Daedalus II patch, which I added to the lower right corner of the Morph tool by click and dragging it over the corresponding square up in the toolbar window of FM8. A Devine Square Pad was the added to the upper left corner of the Morph Matrix. The Eccelcticizer pad is then added to the upper right corner of the Morph Matrix. The Emerging Intruder patch is then added to the lower right corner of the Morph Matrix. At this point your Morph Matrix should look like this, if you are following along with the lesson. 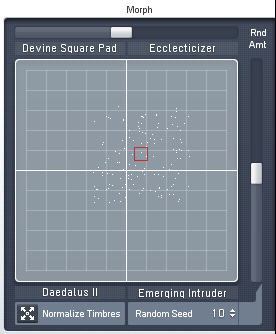 Now when you first look at this feature, it can appear that you are only able to mix a small area of the sounds together. But that is exactly what the sliders on the top and right-hand side of the matrix window are for. Adjust these to about the half way point and you will see a scatter of dots appear on the matrix. Depending on where you have your red target box positioned, these small grains can pull in bits of sound from each of the four quadrants. In the image below you can see that I have also changed the Random Seed value to 10. This changes the grain pattern and offers you a different set of points to draw sounds from. The Easy/Morph window allows provides access to modulation, timbre, effects and envelops, which makes it very simple to make some quick adjustments to your new sound and called out different elements to make it fit your project better. Below is our new sound along side some drums so you can get an idea of how the pad works with other sound in play. You should try inserting some effects in your DAW to take this sound even further and really make it your own. I hope you have found this FM8 tutorial helpful in understanding how the Morph feature work and how you can apply it to your own projects. If you have a request for a future post, please let us know by send us a message. Thanks for stopping by!